Sergio Garcia is seeking to regain the form that saw him climb to third in the world rankings. 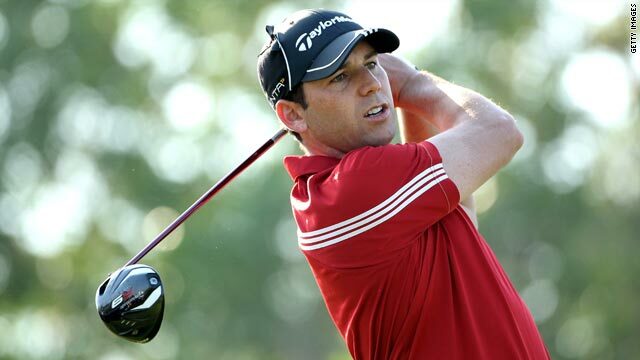 (CNN) -- Sergio Garcia continued his bright start to 2010 as he reached the halfway stage of the Abu Dhabi Championship just one shot behind surprise leader Rick Kulacz. The Spaniard, who has slumped from third to 13th in the world rankings, carded five-under-par 67 in Friday's second round to be in a tie for second with Sweden's Peter Hanson and Irishman Shane Lowry. Hanson also shot 67, while Lowry leaped up the leaderboard with a sparkling 65. But unheralded Australian Kulacz set the marker on 12-under 132 after going even better than Lowry, notching 11 birdies in his 63. The world No. 244 has only limited playing rights on the European Tour this season after his efforts in qualifying school, where he shot 64 in the final round, but he was given a sponsor invite for the Middle East event. Garcia, who was tied for fourth after an opening 66, showed no signs of the wrist problem which plagued him at the end of last year. Starting on the back nine at No. 10, he birdied three of his first four holes and bounced back from a bogey at the par-four fifth with more birdies at six and seven. Hanson had a flawless five-birdie round to go with his 66 from Thursday, while Lowry also went around without dropping a shot as he moved up from 17th. The 24-year-old Kulacz, who has won twice on the Asian Tour, started the day in 25th after a 69. "I was just in the zone. I tried to get it on the green and every putt went in, it was just one of those days where everything went right," he told reporters. "That round is definitely top five in my career. I think the one at Q-School was better under the circumstances -- to get to Europe was pretty special." Defending champion Paul Casey of England was nine shots off the pace after a 69, but runner-up Martin Kaymer of Germany was tied for fifth after carding 67. He was joined on 10-under by England's Chris Wood, who shot 64, and Welshman Rhys Davies (68). England's Ian Poulter dropped from a share of the lead following a 70 to be tied for eighth in a group including world No. 10 Rory McIlroy (69). Lee Westwood, who beat McIlroy to last season's Race To Dubai money list title with victory in the final tournament, missed the cut. The Englishman, making his first appearance of 2010, carded six bogeys in a disastrous 77. "Yesterday was just a really good 69, it could have easily been 77 the way I played," he said. "I got away with murder yesterday, and today I didn't." Meanwhile, the second round of the U.S. PGA Tour's Bob Hope Classic was postponed due to heavy rain on Thursday. It will now be played on Friday, with American Shane Bertsch leading the five-round event in California after his opening 10-under 62.